The following is a guest post by David Bakke of Money Crashers. When I worked in retail, I had a customer who came in regularly to purchase items, and always, without fail, asked for a discount. While I certainly applauded his efforts, I could rarely oblige him – but it never stopped him from trying. There’s no reason you shouldn’t adopt this very same strategy when it comes to your everyday purchases. Avoid paying full price whenever you can, and charm, bargain, and barter your way to discounts. Then, once you’ve mastered those arts, it’s time to move onto the black belt of money-saving ventures. Getting things for free. Double-A, triple-A, 4-volt, and so on. When your remote control conks out on you, you never seem to have that right battery lying around. And when you do have one, it turns out you need two. So, you end up going out and buying eight batteries, using two of them and then losing the rest, so the next time you need them you’ve got to spend another $10. Well, there’s a simple workaround. Sign up for email updates from your preferred office supplier, and several times throughout the year, it’s going to offer you batteries at full retail price, but with a 100%-off rewards voucher which, once you redeem it, amounts to free batteries. From the number of websites that offer low-cost credit reports, you’d think you simply have to pay money to see yours. Not true at all. Each of the three credit reporting agencies (Equifax, Experian, and TransUnion) are required by law to send anyone who requests it one copy of their report every calendar year. Visit AnnualCreditReport.com and request your free copies from each agency in four-month intervals, so you can view a different version of your report three times per year. Don’t pay hundreds of dollars for software programs when you can get them for a lot less. Visit CNET to peruse a wide selection of lesser-known programs, as well as older versions of popular programs, which you may be able to download for free. Before you decide there’s no deal to be found on a specific program you have your eye on, check to see if there’s a comparable version available. Microsoft Office, for example, is the leading office suite on the market, but OpenOffice offers a similar product – and arguably a better one. And if you’re shopping for anti-virus software, a free, basic version is all you need. The top two names to check out are Avast and AVG. Walgreens and FedEx-Kinko’s charge as much as $8 for passport photos. When you’re putting together your passport application, you’re paying the State Department, Post Office, a courier, and possibly an expediting service, so the last thing you want to do is fork over another few bucks for pictures that you should be able to take with any old cell phone. Instead, try uploading your digital photo to ePassportPhoto.com. The site instructs you on positioning your photos, the size you want, and the background color you need. To get the best results at home, print to photo printer paper. It may be hard to believe, but many prescription drugs are actually available for free at certain supermarkets, including Kroger’s and Publix. These are typically generic-issue medications and they may include antibiotics, preventive drugs, or drugs to help manage common chronic illnesses like high blood pressure, diabetes, and kidney conditions. Ask your local pharmacist. Like my former customer said, you never know the answer until you ask the question. In a tough economy like today’s, it’s important to conserve money wherever you can. 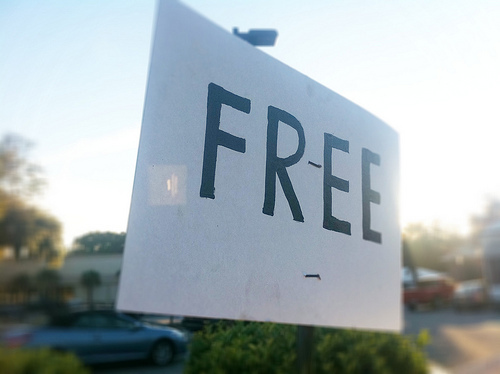 So when you approach a new purchase, ask yourself these three questions: Can I get it for free? If not, what’s the best discount I can find? And, finally, do I really need this item at all? Look at every purchase as an opportunity to save money, and you’re going to end up with a lot more cash in your pocket. What other items can you think of that you can get for free? David Bakke is a money-saving strategist, always looking for new and improved ways to save moolah. He shares his tips on the blog, Money Crashers Personal Finance.